Click on the above image to watch a YouTube video that shows RSpec Explorer in action. Finally, there’s an easier and more effective way to teach visible light spectra to your physics, chemistry and astronomy students — for only $395. 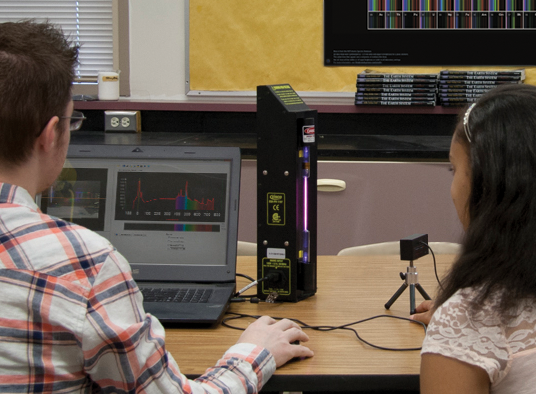 This is the only classroom spectrometer on the market that displays live video, making RSpec Explorer the best teaching tool for your classroom and students labs. Easily demonstrate gas-tube spectra on your overhead projector so everyone sees the same thing at the same time. Have your students do exciting and engaging hands-on labs. With the live video display, your students can make a change and see the results immediately. Identify the contents of a mystery gas tube. Measure flame emission lines of sodium chloride and other materials. 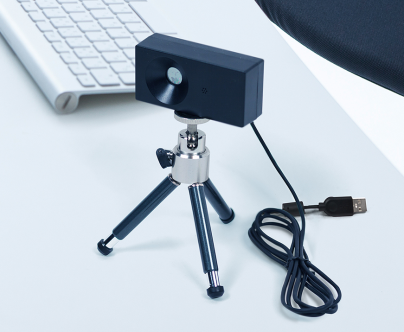 Capture star spectra with a DSLR? Above: Our 24″ x 36″ Periodic Table of Spectra makes it clear to students that each element has its own spectral fingerprint. Use our RSpec Explorer spectrometer for demonstrations and hands-on spectrum labs. From a recent NSTA review (link): “Overall, RSpec Explorer is very easy to use—only minimal setup is required to begin displaying and analyzing spectra” — Edwin P. Christmann, Ph.D, Slippery Rock. Above: RSpec Explorer being used in a high school physics class. 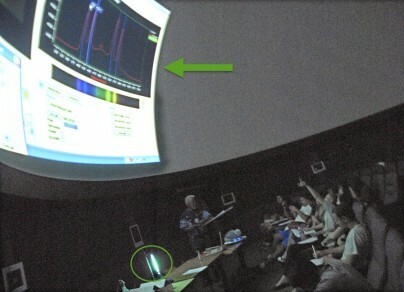 A live video of a gas tube spectrum and its profile graph are projected on the screen at the front of the classroom. Everyone sees the same thing at the same time, eliminating the frustration of hand-held foil, rainbow glasses, and plastic spectrometers. Above: This is a wonderful example of RSpec Explorer being used in a planetarium dome to introduce an audience to the methods astronomers use to study the stars. 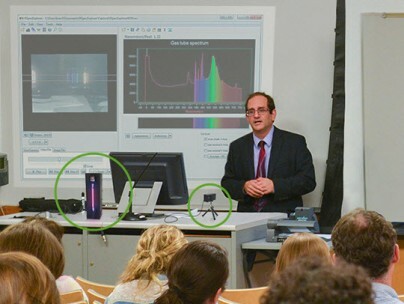 Note the spectrometer and gas tube circled in green on the lab bench in the front of the lecture hall. On the overhead projector, students see a live video of the gas tube. Above: The RSpec Explorer spectrometer requires no calibration or adjustment. Just plug it into your PC's USB port, point it at a light source like a gas tube, and you're ready to go. Above: RSpec Explorer is the perfect tool for physics, chemistry, and astronomy teachers. As seen in this image, the gas tube and tripod can be set up on a lab bench in front of the room where everyone can see them. The gas tube spectrum is projected on the overhead screen. 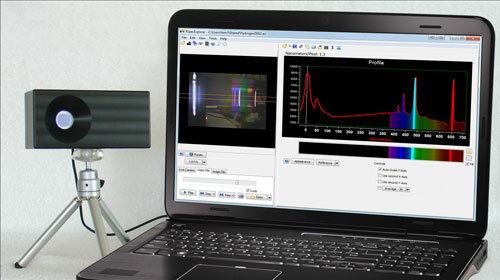 This system is so easy to use that you'll be able to demonstrate spectra like the one above in less than five minutes! You simply start the software and point the camera at the gas tube. There are no hidden calibration steps or adjustments necessary. The tools that have traditionally been used to teach spectra (rainbow glasses, hand-held gratings) frequently leave students (and teachers!) frustrated. Valuable classroom time gets wasted as they struggle to "find" the spectrum. Teachers are thrilled with RSpec Explorer because it totally eliminates that frustration. Everyone sees the same thing at the same time. This radically changes your students' experience. Your job as a teacher becomes much easier because you can focus on the material rather than overcoming obstacles in seeing the spectrum. Above: RSpec Explorer in use in an outdoor setting. Are you looking for a way to bring science to large groups? Or would you like to do more public outreach? or show your Astro 101 class live spectra of stars under the night skies? You'll capture your audience's attention with dramatic and colorful spectra like the one above. Show the crowd the emission features of a gas tube, as seen above. Then show them the similar spectra of a Type A star like Vega, in real-time. This is a guaranteed crowd pleaser! Above: We're impressed by Matthew Sandoval, a tenth grade student in Southern California. He used our Star Analyser grating, a small telescope, and our RSpec software to study the temperature of stars. 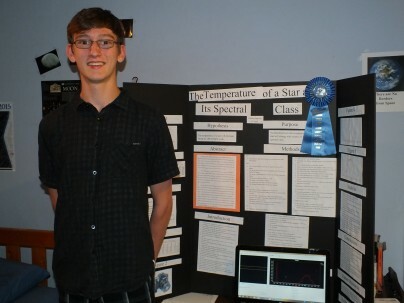 Matthew has now won two regional science fair competitions. We wish him the best as he heads towards the State Fair! 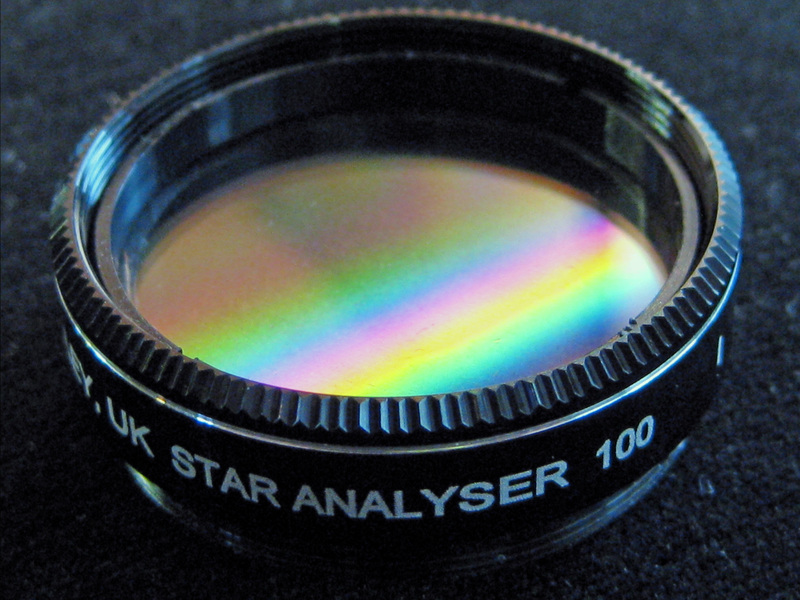 For more information on our Star Analyser grating for observing stellar and planetary spectra, see our Spectra page. Above: High school student Piper Reid receives the Bok Award from the American Astronomical Society and the Astronomical Society of the Pacific. Piper used the RSpec software from Field Tested Systems for her astronomical spectroscopy science project. This is the same software that comes bundled with the RSpec Explorer desktop spectrometer. Use this software with our Star Analyser grating and a DSLR with a tripod (or small telescope) to empower your students to study the stars. The RSpec Explorer system includes a spectrometer and tripod, as well as our RSpec software (Windows or MacOS), which was awarded the prestigious “Hot Product” award from Sky & Telescope Magazine. The RSpec software is easy to learn and easy to use. Start the program, point the camera at your gas tube, and you’ll immediately see the spectrum and graph. There’s no calibration, no steep learning curve. This fantastic system is perfect for teaching light and spectra. It works wonderfully in middle school light and color classes, or high school/college classroom demonstrations and hands-on projects. I was using it ten minutes after I took it out of the box. I’m using the system in a third semester lab course that I teach for physics majors. It works great. I had the students set up the system on their own and use the videos to familiarize themselves with the system. I then gave them a known (H) and an unknown (He) discharge tube and had them generate an annotated plot of each spectrum, identifying the lines. I use this camera for my high school Physics and Astronomy classes. The ease of set up and use make transitioning to demonstrations with the camera and software very quick. The results produced by this camera are excellent. My classes are able to move from viewing spectra to using the spectra quickly and accurately. The built-in library is a great asset, and I use it during lectures introducing modern physics and stellar classification. 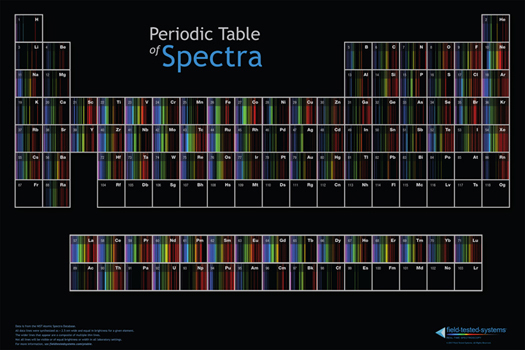 This is a wonderful addition to our classroom, a great hands-on way for my students to learn about spectra. My students are really excited about seeing and understanding spectra in a fun, new way! Engaging in decoding the hidden information in starlight is vital to building a strong conceptual foundation when learning astronomy. RSpec Explorer has totally revolutionized the way we teach Astro 101. It's part of our most popular lab in 15 years. No more frustrating hand-held spectrometers or foil for us! The Star Analyser grating is a perfect fit for us. Other companies were claiming it was "impossible" to do spectroscopy with the filter wheel, wanting us to spend thousands of dollars (that we didn't have) to completely alter our system. They were very obviously off base. This setup is exactly right for teaching our students how to do spectroscopy research, which is our main goal. Ron Diiulio at the University of North Texas uses RSpec Explorer to introduce liberal arts students to light and color. “Our lab with RSpec Explorer is the most popular lab we’ve done in 15 years! We think that’s because of what we call the “CSI Effect.” Ten years ago, high-tech was only for nerds. But, thanks to TV programs like CSI, these days most students love high tech. And RSpec Explorer is a perfect fit. “Over the years, we tried everything: hand-held plastic spectrometers, rainbow glasses, and everything else you can imagine. “We wasted a lot of classroom time as students struggled to find the spectrum. They didn’t understand what they were seeing. They couldn’t really work in teams because they each had their own private view of the data. And, they had no way to capture and record their data. The labs just weren’t worth the frustration and hassle because the kids weren’t learning. “RSpec Explorer changed all that. Over the past several years, over 6,000 liberal arts majors have successfully completed our RSpec Explorer lab. It’s our students’, TAs’, and instructors’ favorite lab. I think the lab is so popular because it’s hands-on and easy to understand. 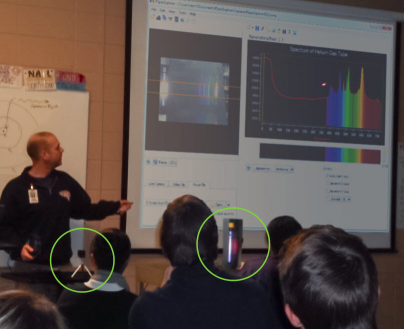 The live video spectra produced by RSpec Explorer engages the students in a way we’ve never seen before. “Next, the students break into teams [as shown in the photo above] and capture the spectra of several gas tubes. These teams observe the emission lines of different elements, and identify them using the RSpec Explorer reference library. This is a complete lab at this point. Students come away with a far, far better understanding than they got in the past using other instruments. “But, because we have small telescopes available, we go a step further. 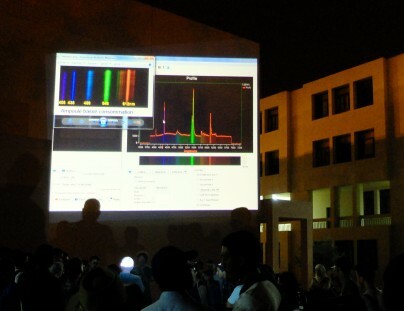 Outside, the students capture the spectra of several bright stars using the Star Analyser grating, a thumb drive, and a video camera. Then, back in the classroom, they compare the star spectra to the gas tube spectra they captured earlier. In this step, students “discover” Hydrogen on the star by noting the match between the Hydrogen gas tube spectra and the star spectra. Wow! You can purchase the RSpec Explorer system for just $395 at our on-line store: link or send us a PO. Order today and you’ll have your system in three days. Use it in class next week! 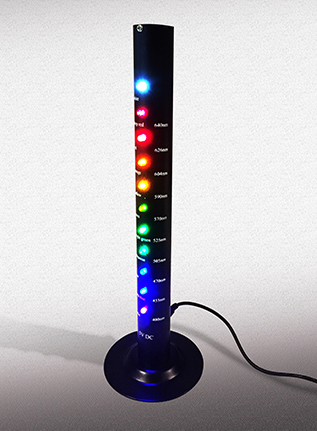 For an additional $79, you can add the colorful LED Tower shown in our YouTube video. The Tower makes a perfect companion to RSpec Explorer. Use the two together to capture your students’ attention. Challenge them to explain what they’re seeing and then measure it. Have a DSLR and tripod? Capture the spectra of stars. It’s surprisingly easy. You can use the RSpec software that comes with the RSpec Explorer spectrometer. Just add our Star Analyser grating ($199) and a thread adapter ($38) to a DSLR or small telescope/CCD. For details, see our star spectra page: link. Questions? We’re here to help. Use our contact form (link) or call our Help Hotline at 206.453.4851 to get your questions answered by an expert in the field.